Bradenton -- A painting of the Virgin Mary on the front of an elderly woman’s trailer at the Tropical Palms Mobile Home Park in Bradenton that her landlord wanted taken down, will remain right where it is after the two sides settled their dispute. The terms of the settlement were not disclosed and all sides have gone silent, an indication that some type of gag order was placed on the parties involved, which is not unusual in such cases. Attorney Bryan Levine, of Knox Levine, represented the Tropical Palms Mobile Home Park’s board of directors in trying to force 85-year-old Millie Francis, a devout Catholic, to remove the painting. Levine declined to answer whether a gag order was preventing comment about a possible deal. However, a letter to the state obtained by the Bradenton Herald states that a settlement has been reached. The letter was dated March 8 and sent to the Department of Business and Professional Regulation, which oversees arbitration cases for the Division of Florida Condominiums, Timeshares and Mobile Homes. The Virgin Mary painting on the front of an elderly Bradenton woman’s trailer will stay after the two sides reached a settlement agreement. At Francis’s trailer on Thursday, the only visible change was that a new awning had been installed to help protect the painting from weather. While Francis has not spoken to the Bradenton Herald since a settlement was proposed, she had previously said she planned on putting up an awning from the beginning of the controversy. L.A. “Tony” Kovach, a manufactured home expert with 25 years in the industry and publisher of two trade publications, has been following the issue closely. The saga began in October when Francis wanted to replace her front window because security personnel were shining flashlights into her home late at night. 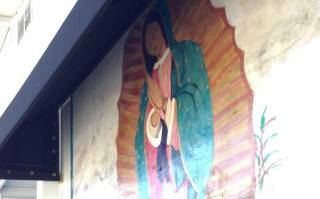 Francis received permission to do the work and after replacing the window was inspired while at church to commission an artist to paint Our Lady of Guadalupe, one of Mary’s many titles, on the space. Francis remained defiant and with some outside help began to mediate the case, which has now been resolved.